HPD REMEMBERS ARMY SGT. 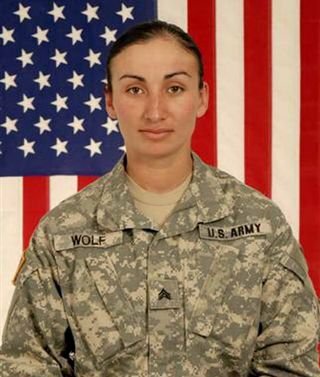 EDUVIGES "DUVI" WOLF WHO DIED OCTOBER 25, 2009 WHILE SERVING HER COUNTRY DURING OPERATION ENDURING FREEDOM. "DUVI" WAS A FORMER HPD EXPLORER. “Eduviges “Duvi” Guadalupe Preciado Wolf was born on February 12, 1985, (Lincoln’s Birthday), in Cocula, Jalisco, Mexico to Miguel and Ana Maria Preciado. In the late 1980’s Duvi’s family moved to CA. They eventually moved to Hawthorne. While attending Leuzinger High School she joined the J.R.O.T.C. program and was promoted to Battalion XO, or second in command before she graduated. When I met Duvi she was 15, two of her sisters, Cecilia and Ana were graduating from the South Bay Regional Law Enforcement Explorer Academy. She followed in their footsteps and graduated, also. I remember teasing her because when she was in uniform she wouldn’t smile, she always said it didn’t look professional. Duvi earned her promotion to Explorer Sergeant in January of 2003 and became an Explorer Lieutenant in June of 2003, the highest rank at the time. 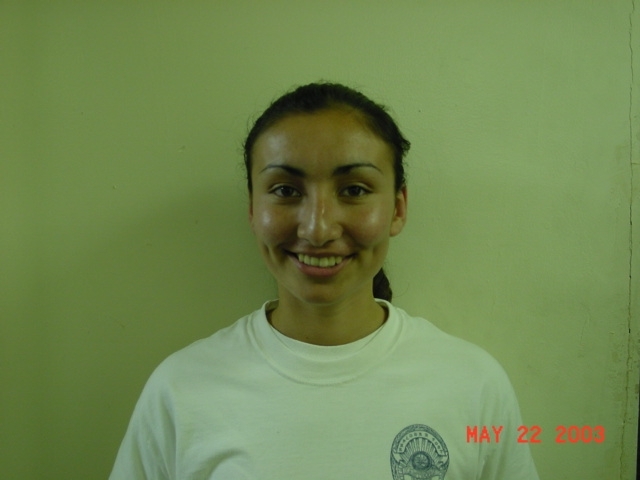 She was a Drill Instructor for the South Bay Regional Law Enforcement Explorer Academy from Class #44 through Class #47. Whenever there was a project to be done she was the first to volunteer, whether it was something fun or a work event. There were many assignments for the Post from fingerprinting to directing traffic, translating Spanish to grading notebooks, etc. We had fun, too and could usually be found at Denny’s when the project was over. The Academy was running smoothly, when Duvi told me she had joined the Army and would be leaving in early November. The Drill Instructor’s and the Explorers were heartbroken that she wouldn’t be there for graduation, but it was time for Duvi to move forward to a new chapter in her life. When Duvi met Josh she found her prince, whenever she was around him she glowed. I was lucky enough to meet him when they came home for a visit. When they had Isabel I received pictures and Duvi was now a Mom. She was mature beyond her years; she chose to take the more difficult path in life when many young people would have taken the easy way. Every person she came in contact with walked away a little smarter, a little more caring, a little more humble. For you see, Duvi was an example of what’s good in this life, she was honest, loyal, trustworthy, dedicated, loving, tough, (when she needed to be), quick to smile, tell a joke and make everyone feel at ease. She was one of those rare individuals that did what was right, because it was right, not because someone was watching her. Police Service Officer Susie Martin, who supervised Duvi while heading the HPD Explorer program, has been with the Hawthorne Police Department for over 36 years. Susie's Father, Harold Martin was a HPD Officer for over 30 years along with her uncle Kenneth R. Stonebraker who was the Chief of Police from 1981-1989. Her vehicle is attacked in eastern Afghanistan's Kunar province, on the Pakistani border. She was the mother of two young children; her husband also is serving in Afghanistan. As a teenage cadet with the Hawthorne Police Explorers, Eduviges “Duvi” Wolf was faced with a wall she couldn't overcome. It was a 6-foot-high wooden wall -- a head taller than her -- part of an obstacle course at the El Camino College athletic fields. Over the next six weeks, Wolf threw herself at the wall over and over again, for several hours at a time. Her arms and legs became black and blue with bruises. But she was ecstatic the day she finally clambered over it. The Army sergeant approached everything else in life with the same dedication and vigor, whether it was the Police Explorers, the military or motherhood, her friends and family said. In October, five months into her first tour in Afghanistan, a captain in her unit asked for volunteers for a supply mission. Wolf raised her hand even though she was still recovering from an injured foot. She refused to use crutches or take pain medication and wanted to do everything like her fellow soldiers, her family said. "Typical Duvi," said Susie Martin, a police service officer who supervised Wolf in the Explorer program, recounting the story. "Everything about her was enthusiastic. . . . If it was something fun, she was the first one to volunteer. If it was something nobody wanted to do, she was still the first one to volunteer." The supply mission would be her last. Wolf was killed Oct. 25 when her vehicle was attacked with a rocket-propelled grenade in eastern Afghanistan's Kunar province, on the Pakistani border. She was 24. She was an automated logistical specialist assigned to the 704th Brigade Support Battalion, 4th Brigade Combat Team, 4th Infantry Division at Ft. Carson, Colo.
Wolf, whose maiden name was Preciado, grew up in Hawthorne as the youngest of four sisters in an immigrant family from Guadalajara, Mexico. From a young age, she was responsible and focused, a tomboy who always kept her hair pulled back in a tight ponytail and wanted to run around outside when her cousins wanted to play with dolls or experiment with makeup. Her father, who worked as a gardener, taught all his daughters to play the violin. But Wolf played exceptionally, her family recalled. Her father beamed as he distributed CDs of her mariachi music performances to friends and family. Wolf's dreams of becoming a police officer began with the television show "Cops." The sisters crowded around the TV and sang along to the theme song, recalled Wolf's sister, Ana Ross. They used their father's video camera to make their own version playing cops and robbers, and admired the officers on the show for the work they were doing to protect the community, Ross said. Wolf joined the Junior ROTC program at Leuzinger High School and the Hawthorne Police Explorers. She recruited a number of her friends to the Explorers, soon tripling the size of the program that began with about five teenagers when she first joined, Martin said. Wolf rapidly rose through the ranks, becoming a lieutenant in the program. After she graduated from the Explorers, she joined the Army because she was still too young to become a police officer, said Ross, who followed in her steps three months later. "She always led the way," said Ross, who is three years older but looked up to her younger sister as a role model. "She was much braver than I was." Wolf's family worried about her safety. Martin, who said the girls became like daughters to her over the years, said they didn't talk to her about the military because they knew it upset her. But, in the end, Martin and her family respected and supported her decision. "I know she did it for her country, and she did it proudly, and did it unselfishly," said her cousin Eufemia Aguilar. In the Army, Wolf joined the airborne school to become a paratrooper but had to drop out when she developed stress fractures in her hips and legs during the rigorous training. She soon found something else: She fell in love with a fellow soldier she met at Ft. Bragg, N.C.
Martin recalled how happy she appeared when she came to visit with her husband, Army Sgt. Josh Wolf. "She was like a little schoolgirl with stars in her eyes," Martin said. The young couple began building the foundations of a family life. Wolf gave birth to two daughters. The couple bought a home and moved to Colorado. Then, this summer, both of them were deployed to Afghanistan. Wolf had a hard time being away from her young daughters, Valeri and Isabel, who stayed with their grandparents in South Dakota. Wolf talked about missing Valeri's first birthday and not being able to pick out a Halloween costume with Isabel, who was 3. But that didn't mean she was any less enthusiastic about her career in the military. Wolf told her family that her time in Afghanistan was fulfilling, and she reenlisted for another three years just a week before she was killed, Ross said. Wolf was due to come home to her daughters for a two-week leave in mid-November. "We pray for her every day," said Ross, who left the military after four years of service and now lives in Georgia with her parents. "She was my sister, my best friend." Newer Post“The death of Andrew Garton"